A friend pointed this one out on the Internet and I had to share it and my musings. Lot 479: A Late 16th/Early 17th Century Leather Black Jack/Water Carrier. The spouted vessel having a crown-form handle to the top and a ropetwist and beaded seam leading down to the circular foot. 14½ ins (37 cms) in height, 13 ins (33 cms) in width. This is a lovely piece and it’s really nice to have the dimensions. The person writing the catalogue entry probably honestly believed the bottle to be English based on the current location and of just an unusual form, optimistically dating it to the 17th century based on the patination and stitching. I have a problem with the description: I think the bottle form is Arabic. You can see much earlier examples showing similar features here. If you look closely at the top, you can see a hole where a missing strap handle was attached. 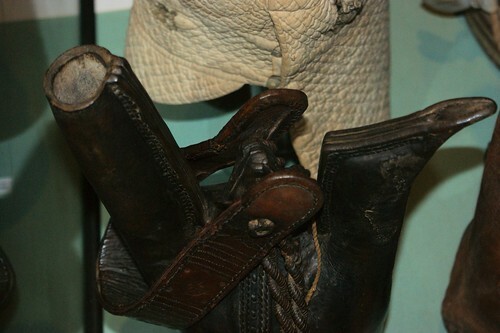 Similarly, there are a few stitches missing on the spout, it looks like the spout has been damaged and the leather trimmed to straighten it at some point. 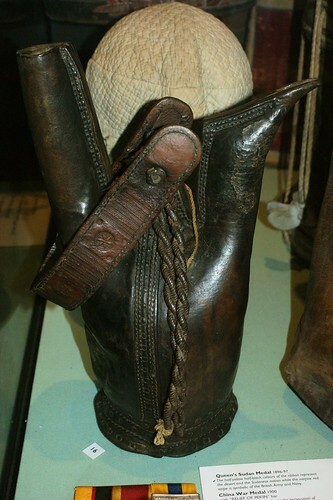 Note the height of the spout and the arrangement of strap and cord handles. 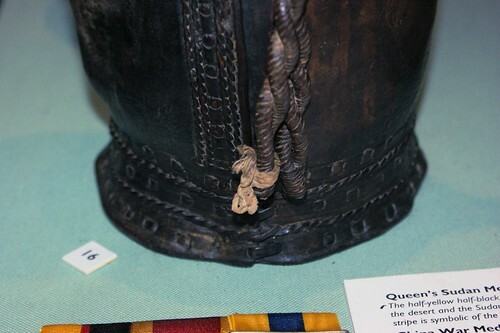 Close up of the base showing the base and side stitching and the roped and beaded decoration. Handle decoration. The edges are bound with another layer of leather. 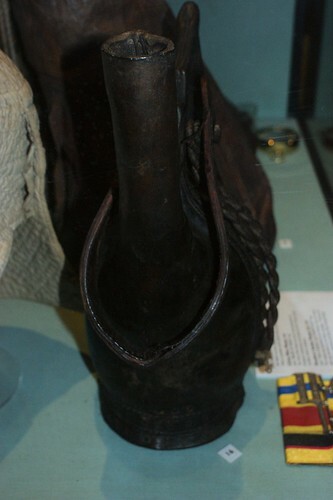 View of the spout and showing the strap handle in profile. 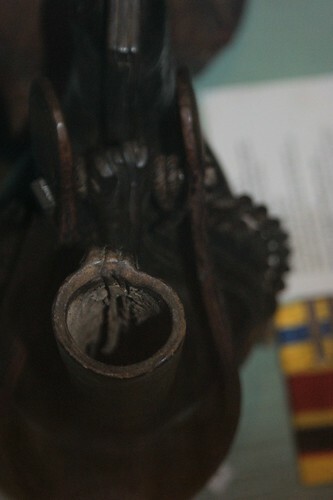 Inside spout, clearly showing welt and seam. Top-ish view showing handle attachment. 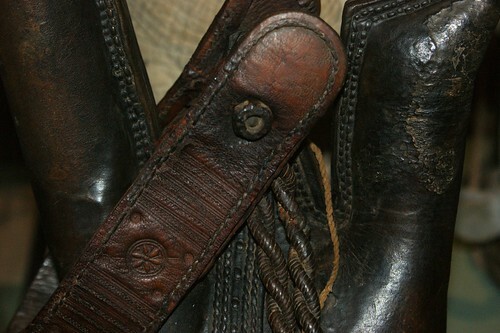 Note the double row of stitching on the top seam. 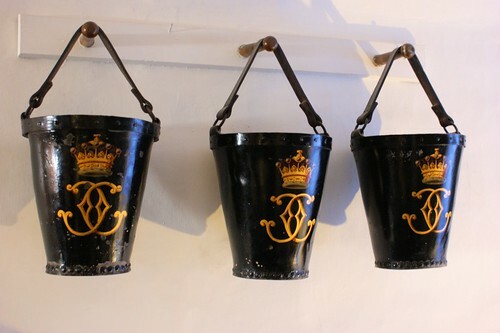 Three leather firebuckets at the top of the main stairs in Cawdor Castle, dating to the eighteenth century, later emblazoned with the lst Earl Cawdor’s coronet and monogram. Construction is riveted throughout and virtually identical to those at Cotehele House in Cornwall, HMS Victory and any number of other sites (including this). The top band and handle loops are metal, these buckets have a particularly fine paint job. Here’s some more photos of the same buckets.